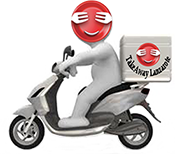 Takeaways Restaurants Food Delivery Lanzarote : Playa Blanca | Puerto del Carmen | Yaiza | Puerto Calero | Costa Teguise | Arrecife | Playa Honda | San Bartolome | Haria | Macher | Femes . Tapas & Starters There are 17 products to choose from. Takeaway Lanzarote - Restaurants Playa Blanca Mushrooms Gratine : stuffed with bacon, onion and gratine with cheese. (Starter). Lanzarote Restaurants and Takeaways - Late Night Delivery - Takeaway Lanzarote Restaurant Playa Blanca - Best Takeaway Delivery Lanzarote - Your Favorite Food to Takeout from large selection of local restaurants in Lanzarote.